Canada Palestine Association » Blog Archive » Hey Justin Trudeau, Canadians Do Support BDS! Hey Justin Trudeau, Canadians Do Support BDS! Justin Trudeau, Enough with the Disinformation! On January 15 2019, Canadian PM Justin Trudeau further embellished his “trash talk” on BDS by responding to a questioner at a town hall meeting with announcing he will “continue to condemn the BDS movement”. The prime minister also repeated the claim that BDS is “anti-Semitic” and alleged that Jewish students are fearful and targeted on campuses “because of their religion” due to BDS-linked intimidation. Trudeau is now fully exposed to all, especially those who might have been previously swayed by his slick image and marketing; the lines are clear, if you support Palestinian rights, you can no longer pretend that Trudeau is anything but a continuation of the Stephen Harper legacy. He does not represent the majority of people in Canada on BDS or Palestine, or on any indigenous issues for that matter. A national survey done almost two years ago in Canada as to how people felt about boycotts found that seventy-eight percent of Canadians said they believe the Palestinians’ call for a boycott is “reasonable”. The disconnect by Trudeau and his government on this issue is intentional and politically motivated. His collaboration with the Zionist lobby is well-documented but let’s suffice by saying that none other than Gilan Erdan, the Israeli BDS-busting cabinet minister, personally congratulated Trudeau on his most recent condemnations of BDS. Against this backdrop you might think that BDS activism in Canada would suffer a setback. Not so! 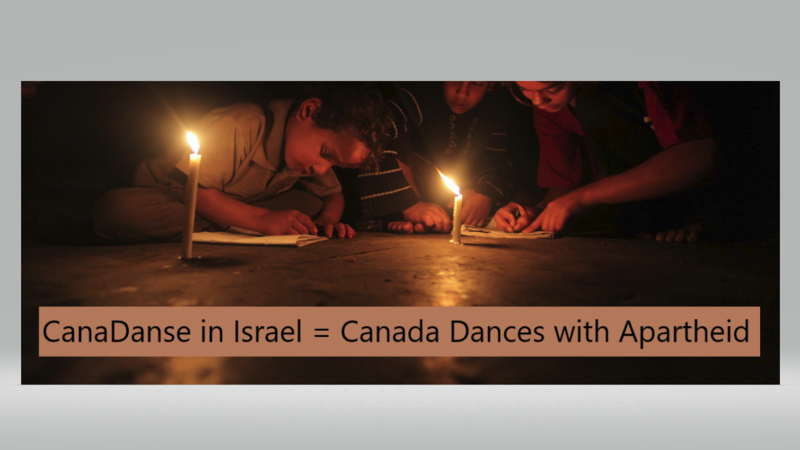 In the last 3 months, activists in Vancouver and across the country have been engaged in a campaign against 3 different ballet companies, as well as several levels of government, that were involved in the CanaDanse Festival in Israel. The initiators of the campaign, BDS Vancouver, were truly inspired by the immediate and overwhelming public reaction and the sense of outrage at the involvement of Ballet BC (and the other participants/sponsors) in this art-washing of Israeli war crimes. It clearly showed that people both within Canada (and globally as the campaign spread) are more than ready to embrace BDS and have strong feelings about why Israeli government policies require sanctions from all sectors of society, both institutional and civic. The first focal point of the campaign was the petition to Ballet BC, which has now gotten more than 10,300 signatures. However, the campaign went far beyond just the petition and emphasized gathering support from activist groups across Canada as well as from within Israel itself (Boycott from Within). It also included leafletting Ballet BC performances, and extensive outreach through social media and other avenues. Ballet BC, Batsheva and the Israeli Consulate: What is this all about?? Why did Ballet BC make this first ever trip to perform in Israel? Why now, with all the horrific things happening on the ground? Was it just part of the increasing moves by the Israeli government to emphasize cultural ties to whitewash its image? Curiously, Ballet BC lists 11 choreographers for its 2018-19 season, and 4 of those 11 are Israeli, with 3 of them citing strong ties with the Israeli Batsheva dance company on their public profiles. Batsheva has a long history of flaunting the BDS call, and is often touted as a cultural ambassador for Israel. Activists were also shocked to find that the Israeli consulate in Canada back in May 2017 was a sponsor for one of Ballet BC’s performances by Ohad Naharin, probably the best known of the 4 mentioned choreographers. They had hoped that Naharin, who recently stepped down as Artistic Director at Batsheva after 30 years, might seize this moment and this change of company to act upon his professed support for Palestinians. They were disappointed. As they were disappointed by the Georgia Straight, Vancouver’s leading “progressive” newspaper and also one of Ballet BC’s most ardent media supporters. Despite many attempts to contact Georgia Straight with press releases and other information, the paper never covered the campaign calling out Ballet BC for performing in Israel. In contrast, one of the 2 corporate media sponsors of Ballet BC, City (CityNews), ran an extensive article early in the campaign presenting both the activists’ demands and Ballet BC’s response. Given the Georgia Straight’s history as an “anti-establishment alternative to Vancouver’s conservative daily newspapers”, and some good coverage in the past of Palestinian events, activists were baffled (and still are) as to why this story was so “off bounds”. Despite the herculean efforts of the Israeli government to tarnish and smear the Boycott, Divestment and Sanctions movement as “racist and divisive”, even “terrorist”, BDS campaigns continue to increase in popularity with an expanding breadth of support. And the Ballet BC campaign is just one example of that. The more the Israeli government rants about BDS, the more it seems to grow in strength. 2018 was a pivotal year in exposing the brutality of the Israeli government towards Palestinians, especially in the Great Return March, and we may have reached a watershed moment for BDS that can only intensify.